The Oklahoma City Thunder are an American professional basketball team based in Oklahoma City, Oklahoma. The Thunder competes in the National Basketball Association as a member club of the league's Western Conference Northwest Division. The team plays its home games at Chesapeake Energy Arena. The Thunder's NBA Development League affiliate is the Oklahoma City Blue, which it owns. The Thunder is the only team in the major professional North American sports leagues based in the state of Oklahoma. The Oklahoma City Thunder are an American professional basketball team based in Oklahoma City, Oklahoma. 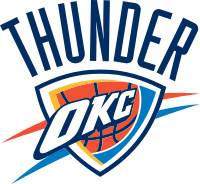 The Thunder competes in the National Basketball Association (NBA) as a member club of the league's Western Conference Northwest Division. The team plays its home games at Chesapeake Energy Arena. The Thunder's NBA Development League affiliate is the Oklahoma City Blue, which it owns. The Thunder is the only team in the major professional North American sports leagues based in the state of Oklahoma.